Working around the post involves crocheting around the post (the part of the stitch that goes down between the rows) rather than into the loops at the top of the stitch. To work a front post stitch you place the hook under the post from the front of the work. To work a back post stitch you insert the hook from the back of the work, over the post the back through to the back of the work. You then work the stitch as you would if you had inserted the hook through the top loops. (If you are working a treble then you need to yarn over as normal before inserting the hook.) In patterns the stitch is referred to as bp (stitch name) ot fp(stitch name), for example bptr (back post treble). 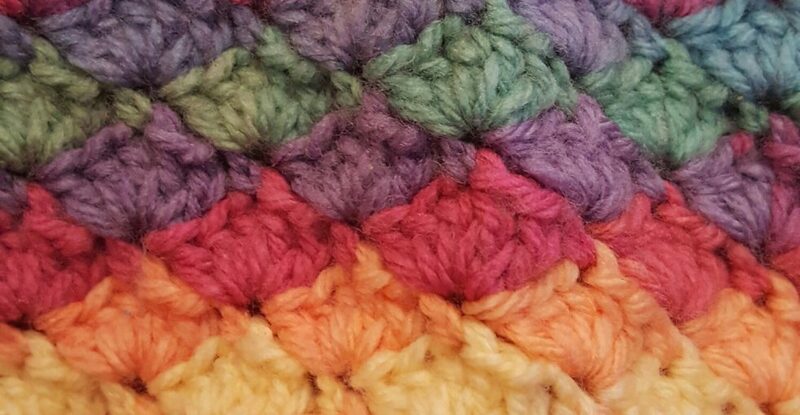 I was totally amazed at the effects you can create by working into a different part of the stitch-this basket weave stitch has to be a current favourite; I think it will feature in a few blocks on my blanket. The other ‘under’ is ‘underestimating’. As in underestimating the amount of yarn needed, or underestimating the size of a finished project. A favourite game of many crocheters (and knitters) is a fun but tension filled activity called ‘yarn chicken’. It basically involves trying to complete a project when the ball of yarn (which by this point usually resembles a bird’s nest) has only a limited amount left. It can go one of two ways-you finish with three inches of yarn to spare and rejoice, or you run out with 10 stitches to go and turn the air blue. It’s quite hard to predict, and everyone knows that if it looks like the yarn might run out then you have to crochet faster to make sure it doesn’t (you only have to watch someone who is playing yarn chicken to confirm this). It’s almost always guaranteed that if you run out you will not be able to find the exact same dye lot and you’ll need to get creative to finish it off-a chunk of a different colour, frogging the whole row and using another colour, or some clever adapting of the pattern, e.g. changing trebles for doubles. I’ve also read (but never tested the theory) that if you run out with only a couple of stitches left you can sometimes frog that row and because the yarn has stretched (if it’s acrylic) you might be able to just eke out that last stitch or so. It’s probably worth a go if you’re only a tiny bit short, and if you can face the potential disappointment of losing to the yarn twice! Thanks for reading, I hope some of it has been informative! Have you ever played yarn chicken? Did you win or lose? Have you tried a project where you had to crochet around the post? Previous Post Sophie Won a Prize! I’m still fairly new so running out of yarn happens more than I’d like to admit. So this is what you call it “Yarn Chicken” how funny I call it “Noooo not again”. FP and BP I learned on you tube and confirmed the stitch with my moms. She’s great at crocheting. I do like the way the stitch looks but haven’t made anything out of it yet. This was fun to read MrsCraft! I need to pass your blog over to my eldest twin. She has just taught herself to crochet, like a week ago, and is now doing it (almost without needing to look at what she is doing). It’s incredible to me because I found/find crochet really hard yet she has taken to it like a duck to water. She’s currently crocheting a caftan (!). I can barely manage a dish cloth. I’m a little envious…..! Haha, you know what, I thought the same when I attempted the stupid slippers with the post stitch that I just couldn’t do! 😉 hahahahaha, that it is.